Important Made in USA Origin Disclaimer: For certain items sold by Walmart on Walmart.com, the displayed country of origin information may not be accurate or consistent with manufacturer information. For updated, accurate country of origin data, it is recommended that you rely on product packaging or manufacturer information. 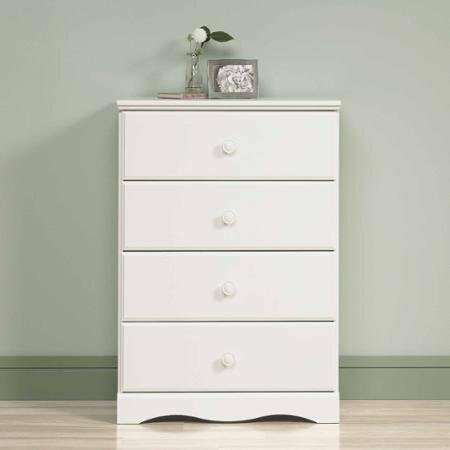 The Sauder Storybook 4-Drawer Chest is made in a transitional style and features a soft white finish for an elegant addition to your room's decor. Its drawers include metal runners and safety stops that feature a patented T-Slot assembly system for easy operation. Some assembly is required with this soft white drawer chest.